Despite the overwhelming opposition on the left to the war in Iraq, many prominent liberals supported the war on humanitarian grounds. They argued that the war would rid the world of a brutal dictator and liberate the Iraqi people from totalitarian oppression, paving the way for a democratic transformation of the country. 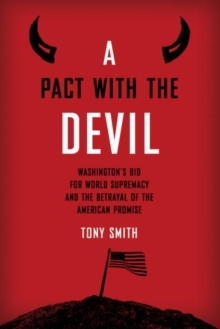 In A Pact with the Devil Tony Smith deftly traces this undeniable drift in mainstream liberal thinking toward a more militant posture in world affairs with respect to human rights and democracy promotion. Beginning with the Wilsonian quest to `make the world safe for democracy' right up to the present day liberal support for regime change, Smith isolates leading strands of liberal internationalist thinking in order to see how the `liberal hawks' constructed them into a case for American and liberal imperialism in the Middle East. The result is a reflection on an important aspect of the intellectual history of American foreign policy; establishing how a sophisticated group of thinkers came to fashion their recommendations to Washington and working to see what role liberalism may still play in deliberations in the country on its role in world events now that the failure of these ambitions in Iraq seems clear.